You know when you get together with a group of people that you don’t really know and the question comes up “so…what do you do?” During a recent situation like that, It came to my attention that people don’t actually know what Interior Designers do! Once you’ve decided to reach out, we schedule a phone call so we can get to know each other and I can learn more about your project. It’s important that we connect over the phone and see if we click. If we are going to work together for months on end, we definitely need to have a good rapport! If you’re ready to move forward, we schedule an in-home consultation. We refer to this as the start of your project because we’re not just shooting the breeze for two hours but reviewing your needs, asking loads of questions and really trying to get a handle on what you want. We keep these notes with us throughout the entire project and refer to them constantly so the consultation is a necessity. The consultation also helps us determine your financial investment. We dig into what you want for your home and how much you want to spend. To use a car analogy - do you want a Mercedes C-Class but think you’re going to spend what a Subaru Outback costs? We want to land on a budget with you so we can work towards creating a space that suits you specifically and is realistic (for both of us) financially. At the end of the consult, if you dig us as much as we think you will, we cross all of the ’T’s and dot all of the ‘I’s and we’re officially off to the races! This means we schedule a date to come back to your house to take pictures, measurements and document furniture and accessories. We also create a Pinterest board for both of us to pin images on so we can have a visual dialogue between us throughout the project. You might say “modern” but mean “more current than what I have” so having photos to refer to and make notes on is extremely important. After this, you may not see us much but that is because we have our heads down conceptualizing and designing your new home! 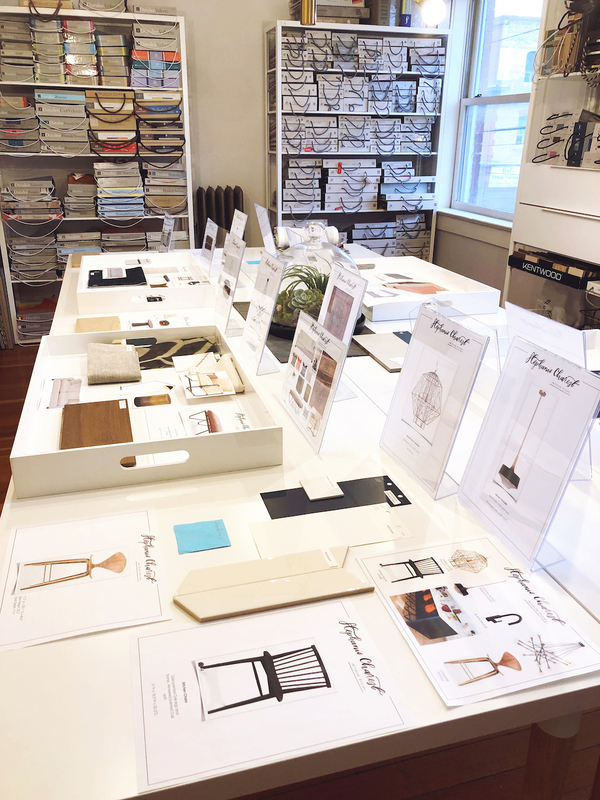 It takes some time for us to draft floor plans and furniture layouts, source materials, lighting and furniture and to consider how every room will look so that we can schedule you in for a client presentation at our office. However, we will be in touch with you continually as we want this to be collaborative and to ensure you are getting exactly what you want for your home. Concept reveal day: this is a fun day! We pop the prosecco and walk you through how your completed project will look. We’re showing you fabric samples, wallpaper, images of furniture and lighting as well as furniture layouts and elevations of features in your home. Go check out the video we had shot of a client presentation so you can get a sense of how that day might be for you! If you love what we’ve presented as much as we hope you do, we’ll then begin procuring the items we’ve selected so that we can set a completion date. Once orders have been entered, we track them continually and work out the logistics of having your project completed by the reveal date. It’s an insane amount of detail to coordinate but the great thing is that you don’t have to lift a finger because we are on top of everything! Ideally you’ll be able to stay elsewhere for a few nights so we can deliver furniture and accessories without you seeing anything. This isn’t always possible, but we always hope for you to be surprised at the big reveal! After we’ve installed the furniture, hung artwork and styled the spaces we’ve planned for months, we eagerly await your arrival home. There’s more prosecco and snacks and this is when you are seeing what we’ve curated for you over the past few months. This is even more fun than that client presentation obviously as we’ve now crossed the finish line together and you get to live in the beautiful space we’ve created! So at some point we will indeed pull out our paint fans, karate chop your pillows and deal with bolts of fabric but as you can see, there is so much more to it than that. We’d love to help you with your project and hope you see how much work (and heart) goes into getting you the house of your dreams!